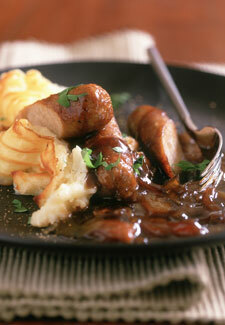 If there is one meal that most of us love tucking into, its got to be sausage and mash. And to get the weekend off to a cracking start, Lidl are offering this hearty meal at half price. Their delicious weekend deal means Hazelmead Farm British Pork sausages are reduced to only 74p, while Fresh British Baking potatoes are 60p per kg. So with Lidl sorting the main ingredients, the rest is up to you. Team with your fave vegetables, like caramelized red onions or carrots, or keep with tradition and add nothing more than lashings of gravy.